Availability of safe and affordable housing is a problem that every community is experiencing nationally. In UWECI’s five-county service area, housing continues to be the number one need. Housing is more than a shelter: it is a home. A home directly affects overall health and well-being and is an asset that builds financial stability. When families lack stable housing, the entire family suffers. Looking at housing cost burden rates is one way we can assess this problem. Households are housing cost burdened when they spend more than 30% of their monthly income on housing costs. Extremely housing cost burden is when households pay more than 50% of their monthly income on housing. Spending that much on housing alone severely limits a household's ability to pay for other necessities like food, clothing, and healthcare. In UWECI’s services area, 1 in 3 renters and 1 in 5 homeowners are housing cost burdened. As many as 72% of renters are housing cost burdened in some Cedar Rapids neighborhoods. 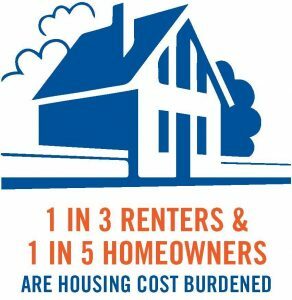 In Linn County, 38% of renter households are housing cost burdened; nearly 1 in 5 (18%) are extremely housing cost burdened. From 2013–15, the average housing costs increased 6.8% for one bedroom and 8.2% for two bedrooms. There are roughly 8,757 renter households that do not have access to affordable housing in Linn County. When affordable housing isn’t available, families must decide if they want to spend more than they can afford on housing or live in poor quality housing. Poor quality housing means assessed at a below normal condition and tend to exhibit leaking roofs, broken windows, rodents, non-functioning heaters or stoves, peeling paint, exposed wiring, or unsafe or unclean environments. Housing matters, and providing homes for unstable, near-homeless, or homeless families is important. Strategies that create safe, stable, long-term, and supportive solutions for families are critical for achieving financial stability. Learn more about how our partnerships with local agencies work to address this critical issue in our Condition of Housing report.